Photographed cleaning the valley today are (from left to right): Ward Councillor Ronaldo Gouws, Imveli Cycling Academy cyclists Sinethemba Ntlali and Lisakhanya Mnjekula, Ward Councillor David Hayselden, Baakens Valley Committee Member Steff Schenk, Bridge Street Brewery General Manager Daniel Huddlestone and Councillor Leander Kruger. The Bridge Street Brewery team took it upon themselves to keep the Mandela Legacy alive by cleaning up the Baakens Valley in celebration of Nelson Mandela, creating a buzz in the valley for one of the most celebrated days in our country. The Valley Clean-up participants gathered on the deck at Bridge Street Brewery, which is situated in the historic Baakens Valley area. The Developing area is rapidly becoming an industrial and manufacturing hub due to the choice of use for the warehouses and other surrounding businesses, including Bridge Street Brewery Beer Manufacturing. Bridge Street Brewery General Manager Daniel Huddlestone was beaming with excitement when addressing attendees about the clean-up. “It is so important yet so overlooked that businesses take care of the environment that they operate in, and do what they can to sustain the environment, just as the environment sustains the business community as a whole, it’s our duty. I don’t think we could have chosen a better way to spend Mandela Day 2018 than taking care of this beautiful Valley that we’re fortunate enough to have as our backyard” he said. 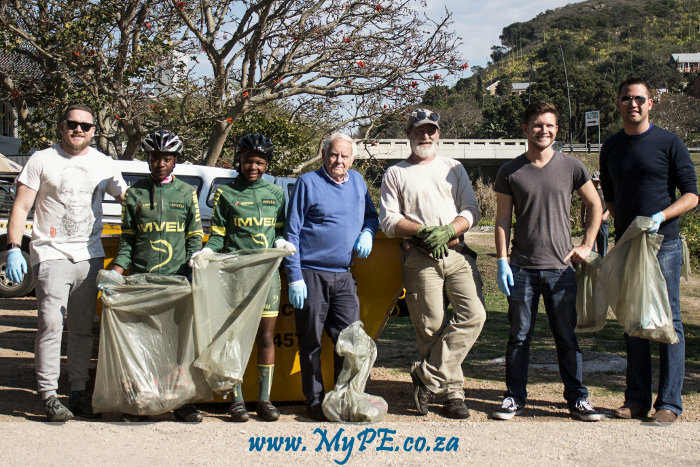 The Clean-up brought many guests to the Valley, with a healthy mix of influencers in the bay, as well as guests of honour like the Imveli Cycling Academy CEO and Founder Lukholo Badi, as well as Ward Councillors David Hayselden, Ronaldo Gouws and Leander Kruger. The Valley Clean-up had an educational aspect added to it by having Environmental Expert and member of the Baakens Valley Committee Steff Schenk, show us which were indigenous and those that were alien vegetation, which were then removed by Mystree Garden Tree Felling and appropriately disposed of by Skipgo, so that our indigenous vegetation in the valley can begin to thrive. “I thoroughly enjoyed the day as I was doing what I am passionate about for such great cause. The educational aspect is a great addition to the day and I am quite impressed with the interest in acquiring more knowledge to improve environmental care and sustenance, because it truly is essential.” Schenk said.